I've recently become obsessed with hummus. It's been popping up more often at the parties and get-togethers I go to than ever before. Not sure why that is, but I'm not complaining. I am addicted to the nuttiness of the tahini (ground sesame seeds, for those of you who aren't familiar with it), the little bite from the citrus, the creaminess of the beans. Perfection in every bite, I tell you. 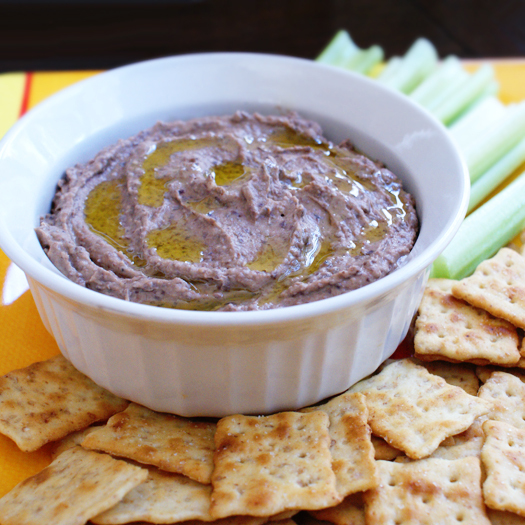 This black bean version is a twist on the traditional chickpea hummus that you are probably most familiar with. If you like that kind, I bet you'll like this, too. The best part? I can snack on this pretty purple dip with little guilt. It's packed with fiber and protein and tastes great with celery sticks! Bathing suit body, here I come! Put garlic in food processor and pulse until it's chopped. Add the remaining ingredients and process until smooth. Drizzle with additional olive oil, if desired. 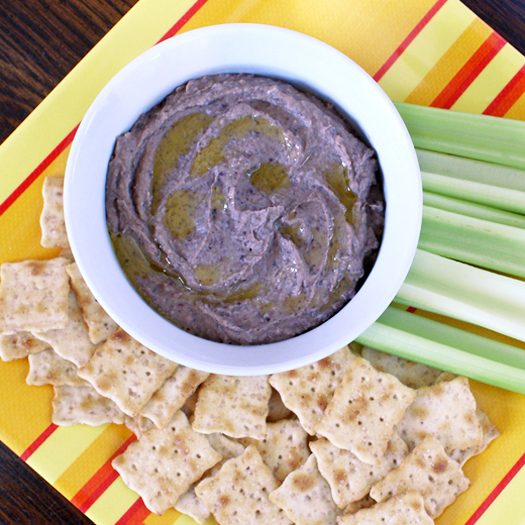 Serve with fresh veggies and crackers for dipping. The crackers pictured are Town House Sea Salt & Olive Oil Flatbread Crisps, which I highly recommend! Add a ½ tsp cumin if you want a mexican flavor. This might seem like an obvious one, but do you cook the beans?